A mad scientist’s workshop, a place where sights, scents and flavors abound, a place of ideas, dreams and history. I’m talking about wineries, people. Wineries are all of these things and much, much more. One of my favorite jobs at J. Rickards Winery (I’m the Director of Sales & Marketing – a big poobah title for “she who does many things”) is blending wines with the winemakers. We’ll take a little of this, a little of that, taste it and decide what we all like the best and voila! We have a new blend! It’s kinda like cooking, but you can catch a buzz in the process. I get paid to do this. Grin. I don’t include the wines of J. Rickards Winery in my reviews because I feel that it wouldn’t be fair or ethical, but I can tell you that the wines are really good. Who ARE these people? This is the second wine I’ve tasted from them and absolutely loved (the first was their Rosé). The wines are well made and well priced. And the labels are really chic, too! 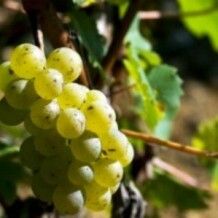 This white blend is gorgeous, with abundant aromas and flavors of citrus, honeysuckle and savory green herbs. Dried flowers, grapefruit, peach and mineral aromas lure the taster into a bright, fresh mouthful of deliciousness. This Sicilian white wine is sassy and crisp, like Ellen DeGeneres wearing a freshly pressed white cotton button-down shirt and pinstriped slacks – she’s cracking jokes nonstop. This wine will make you smile. Lemon, jasmine, honeysuckle, lemon blossoms and toasted almonds set the stage here, from the first sniff, through the zesty mouth and on through the long, juicy finish. Delicious!